Rated 5 out of 5 by amigolepero from Great game!! Loved this game! Really addictive, couldn't stop playing! Still waiting on hobby farm 2? Rated 5 out of 5 by wasmoo from Among the Best in Time Managment I enjoy games with building complexity where it takes many steps to produce a product. Hobby Town fits the bill nicely. Its difficulty increases at a good pace and is never too easy. Great game play with high replay value. The storyline is cute but a bit lacking. That aspect doesn't take away from any of the fun though. Rated 5 out of 5 by Sirocco from I keep coming back for more! I rarely give 5 stars but I have played this game through six or seven times so I must REALLY like it. How can I not give it 5 stars? This game is totally fun and relaxing in relaxed mode because for some bizarre reason I just love collecting melons and eggs and milking goats and arranging the farm in general. It is deeply soothing perhaps because here I have the illusion of control and i can make the world be the way I want it to be. The colours are bright, the story inane and I click through it at top speed but re-arranging my machines and delivering orders is apparently my thing..who knew? I love doing it all in a relaxed fashion so I can enjoy it. I hope you like it to. Tough day, worried sick, visit the island paradise and create a world of your choosing! 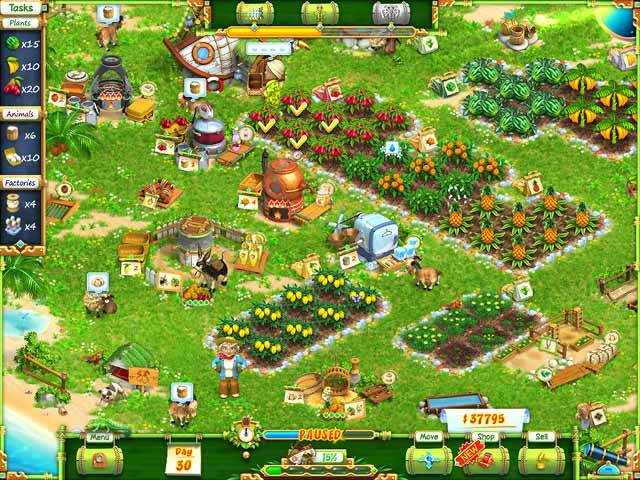 Rated 5 out of 5 by earthgirl09 from Excellent Farming Game This is one of the greatest farming games you will ever play. The graphics and sound are top notch, the story is well-developed, and the atmosphere really makes you feel like you are in a tropical farm. There is plenty of challenge to be found and plenty of fun to be had. I love this game. Rated 5 out of 5 by FrancisMay from Looking for a Hobby? Farming is Fabulous! This game is relaxing. Yes you do a lot of clicking and the timer stresses you out a bit, but that is countered by the scenery, the sense of achievement in ticking tasks off the list, fun storyline and the tropical music (great for us in the Southern Hemisphere as it is currently winter down under!). Problems? My game froze unexpectedly during one of earlier levels, but I just restarted the game and it fixed itself. Also, one of the sheep I was shearing ended up stuck fast in a corner and did not stop 'baa, baa-ing' no matter how many times I clicked on it or tried to give it water due to the water symbol above its head, but that did not affect my game. All up, it is a great game to wind down with after a day at work, and to immerse yourself in a completely different world. The graphics and colour are great, and would appeal to all ages. I would definitely recommend this game! Rated 5 out of 5 by dopey1305 from Great TM farm game! This game is great. TM farm games are among my faves and this is definitely one of the best. Great story, funny too! Also has a relax mode after level 5 so can switch sooner than most TM's with a no time mode. Also a sort of puzzle/strategy game as have to be careful how much you buy or where you put things so have enough room for new things you buy. Great challenging fun! I suggest getting to know by going to level 5 and switching to the relax mode to get the feel first; then hit the timed mode! When is 2 coming out?? Anyone heard?! Rated 5 out of 5 by FLYSPEK from Simply Charming I've played this game about a dozen times so far. It has a very high replay factor. The animals are just totes adorbs. The tasks are reasonable and controls are very easy. It's colorful and has detailed animation. The music is catchy but nonintrusive. The best way to describe it is simply charming. Rated 5 out of 5 by dreamweavers2012 from Super Fun!! I love this game. I have played it over and over and over. I hope you will too. Rated 5 out of 5 by JibbyEllison from Hobby Farm??? 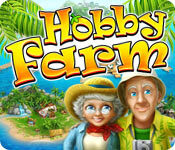 Hobby Farm is a game where Jill (you) and your husband go on a holiday and find an island up for sale. Since you dream is to open a farm, you buy the island and make a farm. Around your island there are many hotels that want your groceries, therefore you plant many different types of seeds, have many different farm animals for many different jobs and have to make many different juices to please your customers, Each level you get a list of what you need to do and you do it but when night falls, all you have is a torch to do your buisness and there are some very wicked people out there. You have to catch all of the wicked people to make sure your farm stays in order. Graphics are detailed cartoons, however the music is LOUD and very annoying, so I put mine on silent. I would recommened this game to children and some adults that love either gardening or a addictive game! Rated 5 out of 5 by Phillybird from Fun work in a Tropical Paradise I love everything about this game, tropical music, the characters, the setting, the tasks. This is a happy game, but don't slack off or the clock will win!! Would love to have a sequel that picks up where this ended. I would buy it, same everything, more of it!! Please! Rated 5 out of 5 by gtitus09 from One of my Fave TM games! I love this game and have played it many times. I love the farming type tm games. I wished they would make a sequel to this. Maybe the couple want to return to see their old farm and find a tsunami destroyed it. So they work together to bring it back, idk, just an idea. The only thing I didn't care for is the further you advance in the game the more they overload you with having to do the machines putting out a humongous amt of product. I especially hated the preserve and java apple machines. But other than that it is a lot of fun. Rated 5 out of 5 by nev77 from Loved it I am big into time management games this one was awesome!! Rated 5 out of 5 by alisha1717 from Very Fun If you like the Ranch Rush games, then you will love this. It is basically the same idea. The only drawback is there is almost no storyline. But there are 50 levels and they are challenging to get the "star" on each level, but not too hard. Rated 5 out of 5 by Marcum from Nice, got it twice I enjoyed playing it greatly on the pc but always tough breaking up my pc time between all my big fish games. So I got this game for the iPad, I enjoy this farming time management game greatly. Give the 1 hour trial a shot, if your into this style of game then you will end up snagging it for sure. Rated 5 out of 5 by Isaryth from Good fun This is one of the very few games I have bothered to play twice in a row. 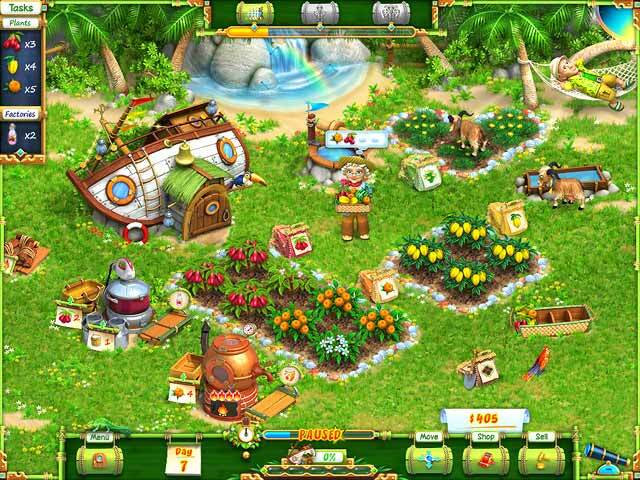 You're tasked with turning an island into a working farm to supply a nearby resort. There are crops and animals to raise, and you can create value added products with machinery. It was fast paced, but not endless meaningless clicking. It wasn't especially difficult - the last level was the only one I couldn't get first go, but still, there are 50 levels, so it keeps you entertained for a while. Rated 5 out of 5 by pa_mike40 from " A Really FUN Game!" Ive really enjoyed this game. Try it...I think you will also LIKE it. Rated 5 out of 5 by blitzieblu from Love this game. I actually had this game on my laptop and when I got my new computer I installed it and played it again. I liked this game a lot, it was challenging and fun. I played each level until I received a star. I'd like to play a Hobby Farm 2. Rated 5 out of 5 by enigma1au from Fun and Relaxing! I can't stop playing this game! It's a great way to wind down and I'm hoping the developers will release a Hobby Farm 2! Rated 5 out of 5 by VinylSea from My favorite time management game! I really, really adored everything about this game. The graphics, story line, and tasks are great. It's highly customizable and really does feel like your own little farm after awhile. :) I'm dying for a sequel now! Rated 5 out of 5 by mileseve1 from Great Game Really enjoyed playing this game. Graphics were good and it was a good game to wind down the day with. 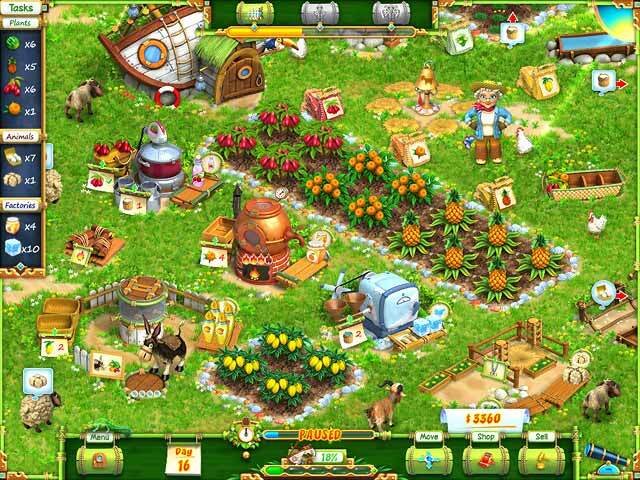 Rated 5 out of 5 by dalaenadm from Farming Fun and Time Management Happiness This is an excellent time management farming game. The graphics are pretty. The story is relatively funny, and the challenge is quite worth the cost of the game. With good preparation before finishing each board, the game is relatively easy to beat on expert level, but it does require a great deal of planning and forethought to do so. The pace of the game is fast, and the graphics and animations are incredibly enjoyable. Excellent challenge! Rated 5 out of 5 by gunjo from A evening after a hard day game A delightful relaxing game great for winding down with after a hard day at the office. Just enough of a degree of difficultly easy to overcome giving the player a feeling of satisfaction. For a serious gamer this game is tame, but this gentle game is perfect for taking the edge off. Hope that a second game based on a similar theme is created. Rated 5 out of 5 by drkne from One of the better TMGs! One of the things I was happiest about with this game was that it lasted a lot longer than most Time Management games. So much better value than most. The graphics are also better than most that you will see as well, but TMGs don't usually rely on their looks for entertainment value, so it's nice to see a fun one that looks good for a change. Things definitely got challenging later on in the game as your "to-do" list gets longer and longer every day. Definitely worth it! Rated 5 out of 5 by Kokomo618 from Time Management at it's Best! I absolutely LOVE this game! I have played it all the way through and from beginning to end was thoroughly entertained - I don't mean in one sitting LOL!!! It IS a bit challenging, but NOT frustrating as I find most time management games to be. I really wish there were more games like this one!!! Hope they bring out a 2nd edition of this one!! (and a 3rd, 4th, 5th...LOL!!!) Guess I'll just keep playing this one over and over again! Rated 4 out of 5 by Ickis from Great Time Managment Game with Relaxed Mode Option If you enjoy farm type games like Ranch Rush, Farm Mania, Farm Frenzy etc, you will likely enjoy this game. What I like best is the casual/relaxed mode option. I used to be a big fan of time management, but maybe just getting older and more often want a relaxing game more than a challenging one. I enjoyed the graphics, color, sound etc. Like the element of strategy. Fitting everything in the space provided can be a bit of a challenge. Main negative is that after playing a few times through, the extended dialogue bits that come up a few times between levels cannot be skipped altogether instead of clicking next over and over. That said the negatives are pretty minor. Rated 4 out of 5 by Ecilia from Fun Fun. Simple, fun and overall a great game if u just wanne kill some time. I ended up playing for many many hours and didnt even notice the times had pased so fast.